The following article appeared on Page 1A of The Gleaner on Thursday 02/16/2017. BETH SMITH/ THE GLEANER HFD confined space rescue training with HWU at a manhole on Third Street. Manholes aren’t exactly known as the most inviting environment. 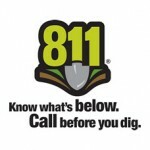 But on a daily basis, crews with the Henderson Water Utility are called upon to descend into these narrow caverns to ensure water and sewer lines are functioning properly. And there’s always the possibility that something could go wrong while workers are down there. 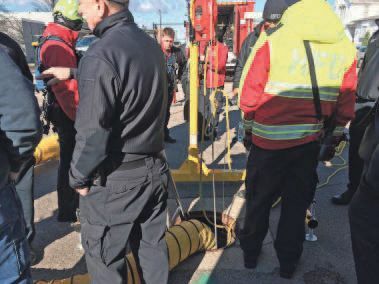 Employees with HWU and members of the Henderson Fire Department teamed up Tuesday and Wednesday to conduct confined space rescue training in a manhole which was 24-inches in diameter and roughly 10 feet deep. It was located in the 300 block of Third Street. Tom Williams, HWU’s general manager, said confined space rescue training is an important protocol just as it is to have the proper equipment and follow correct procedures when working in a manhole. He said in that case, a firefighter was then lowered in to rescue the workers but was overcome with gas fumes. Other firefighters were able to pull him out before he died. Willingly going into a confined space can take mental preparation, especially for those who might not like tight spaces. “We train to make sure everyone is comfortable getting into the manhole for the rescue operation,” Brasher said. All three fire department shifts will train with different water utility personnel so everyone is as prepared as possible. “It’s also important for us to work with water department employees to see what equipment they use and what we would need … what our limitations are” during this type of rescue, he said.